Brimming with angst and sensuality, Beth Yarnall’s Recovered Innocence series kicks into high gear as a hotheaded P.I. unleashes one lawyer’s deepest passions—and greatest temptations. Nolan: Nothing’s ever come easy for me, especially not my dream job at Nash Security and Investigations. Righting wrongs is what I’m meant to do...except I manage to blow the very first chance I get. So why don’t they fire me on the spot? Hell, I’d fire myself if I could. Instead, my boss hands me an assignment that’s too important to screw up—and partners me with Lila Garcia, a gorgeous attorney with curves so distracting they should be illegal. Lila: Like my client, a grieving mother charged with the murder of her own son, I know how quickly the American dream can become a nightmare. If anybody can help me clear her name, it’s Nash Security and Investigations. But Nolan Perry is a wild card. Bending the truth, breaking the law—that’s his business. I need to focus on the evidence. Not on how Nolan’s body fits so perfectly against mine. With a case this personal—and this dangerous—losing control is simply not an option...no matter how badly I want to give in. Reclaim is the third installment in the Recovered Innocence series. Reclaim can definitely be read as a standalone. Reclaim wasn't my favorite in this series. Nolan and Lila are teamed up to free a mother convicted of killing her son. The romance starts off quick, no build up, no lead in. There are some good hot and steamy scenes, but it wasn't enough to carry the book. For me, this book just had a different tone than the rest of the series. I just didn't have a connection with the characters or the insta-love that happened. This is the third in the series, and although some context would be improved by reading the previous two, it could be a standalone. Somehow the romance eclipsed the task in hand, but maybe that was the intention – given that Nolan is a self-professed screw-up, and Lila had issues. That said, it had some really good moments, and Ms. Yarnall can do hot and steamy. I just wasn't entirely convinced of the depth of the relationship. An enjoyable read, and good to get some catch up time with the previous couples. For reviews & more info, check out our Vindicate post. For reviews & more info, check out our Atone post. 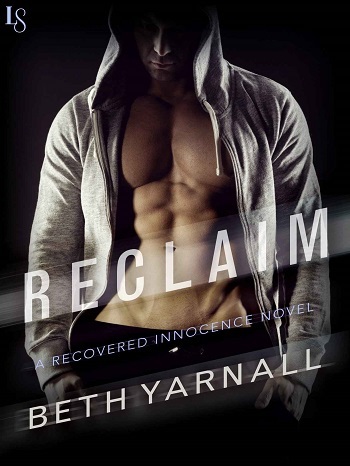 Reviewers on the Wicked Reads Review Team were provided a free copy of Reclaim (Recovered Innocence #3) by Beth Yarnall to read and review.